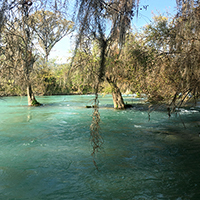 The team pauses for a moment in the Rio Valles, one of several collecting sites in San Luis Potosi. 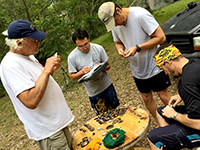 The collaborators include, from left, Kevin Cummings and Jeremy Tiemann, of the INHS; Anna Pieri, of Texas A&M University; Tom Miller, of Laredo Community College; and Charles Randklev and Kentaro Inoue, of Texas A&M. 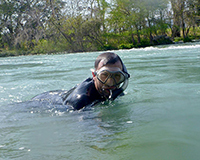 Tiemann snorkels in Rio Valles at Mecos Falls. 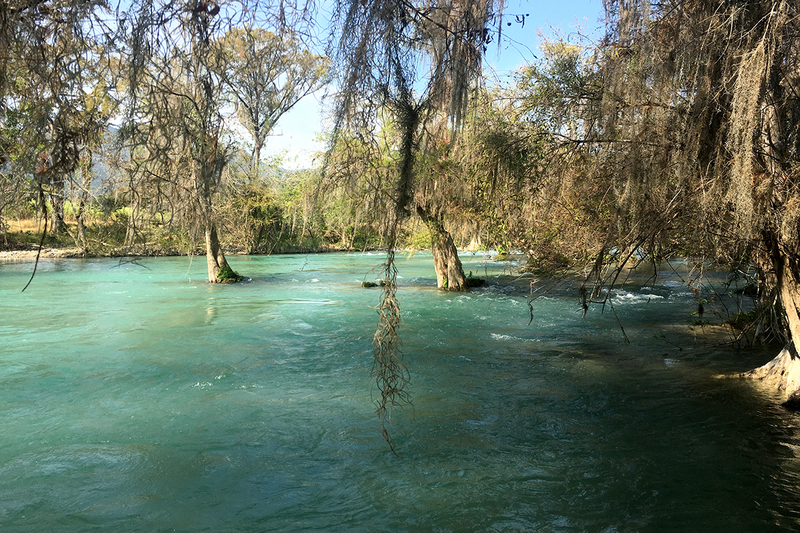 Rio Galinas is one of several mussel-sampling sites the team visited. I am so enamored of the clear water, the vibrant fishes swimming beside me and the carpet of mussels beneath that I keep losing track of where I am. Everywhere I look, the mussels seem close enough to easily pluck, but my depth perception is off. I keep diving down to reach them, but often don’t even make it to the bottom. 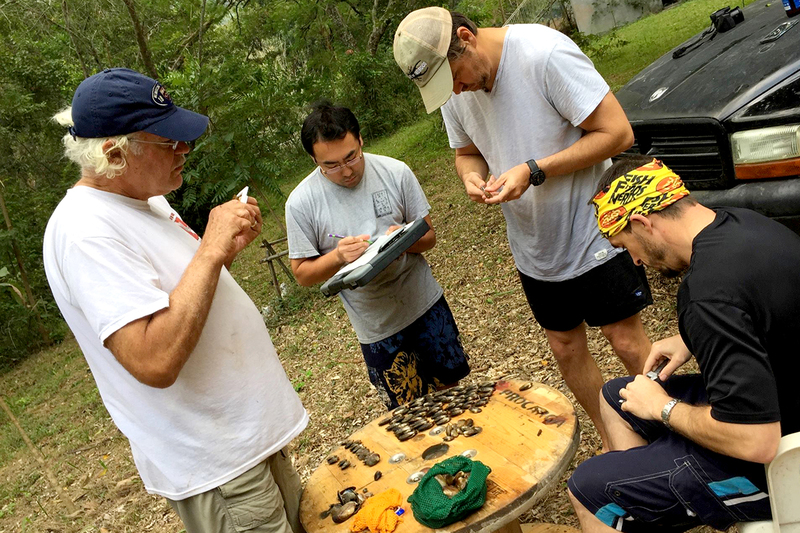 From left, Tom Miller, of Laredo Community College; Kentaro Inoue and Charles Randklev, of Texas A&M University; and Jeremy Tiemann, seated, examine and measure mussels collected on the expedition. Being a field biologist in the U.S. can be somewhat routine. You don’t usually deviate much from project to project. 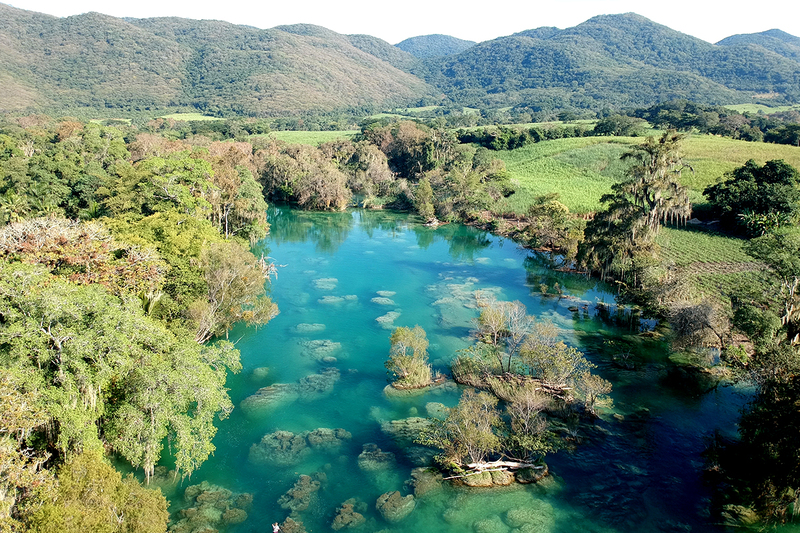 In most of the waterways we visit to do this work, we know what conditions to expect, what animals and plants are present and which sampling methods are needed. Once in a while, however, we are fortunate enough to visit someplace new, where we don’t know quite what to expect. This is one of those places. We are trying to collect freshwater mussels from the Valles River basin in the Mexican state of San Luis Potosi. I am a glorified Sherpa on this expedition, helping my Illinois Natural History Survey colleague Kevin Cummings and several others determine how healthy mussel populations here are. I am wearing a 7-mm wetsuit, thick enough for the cold water, but I don’t have a weight belt. Usually in situations like this I shove rocks into my wetsuit, but there are none around me. Have you ever tried to push and hold a basketball underwater? That’s essentially me. I'm exerting an enormous amount of energy trying to reach the mussels, which, it turns out, are 12 to 20 feet below me. I keep running out of breath and then shoot up to the surface. I'm getting exhausted, and pondering what I could have purged from my suitcase to make room for an additional 40 pounds of lead. As I drift in the water, I decide to float vertically to gauge the water’s depth. The places I can touch are shallow enough to dive unaided by weight. This method is less tiring and more fruitful, and one I will use again on future trips. The team also sampled mussels in Rio Galinas. Overall, this expedition has been a success. We have sampled 12 sites in six rivers. 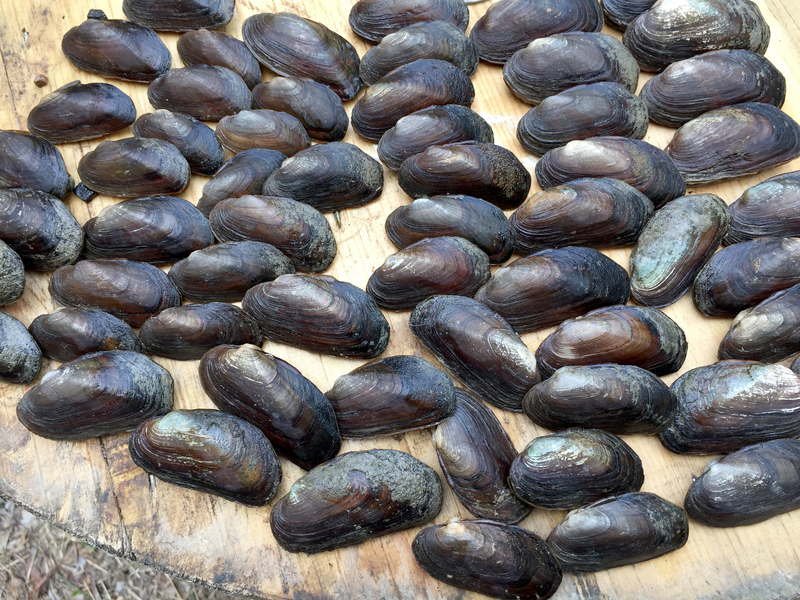 In some places, we found more than 100 mussels an hour, which is comparable to our success in some of the better Illinois streams. As we pack up our gear at the end of our weeklong expedition, I look forward to our return in a year or two to sample even more rivers. Next time, I’ll bring more weight.